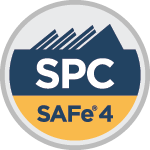 SAFe 4.5 Certified and Experienced! We are Scaled Agile Framework 4.5 certified SAFe Program Consultancy. We have several years of experience helping clients find the value and efficiency this framework is becoming known for. We have guided, coached, and assisted our clients in numerous implementations from 50 to 4000 involved. We are experts in training your organizations leadership the essentials of launching SAFe and creating an environment of constant improvement. We are also Scrum@Scale Certified, so by having both scaling frameworks "under our roof" we are able to help you decide which one may make the most sense for your organization.